October 5, 2018 – Boca Raton, Fla. – gMed®, a Modernizing Medicine® company, has officially rebranded to Modernizing Medicine Gastroenterology. The Modernizing Medicine team will unveil the new brand along with the latest additions to the gGastro® Suite, at the American College of Gastroenterology (ACG) 2018 annual meeting in Philadelphia, Penn. from October 5-10, 2018. The new brand identity signifies the company’s continued commitment to improving gastroenterology practices’ operational workflow, reducing administrative burden and increasing patient, employee and physician satisfaction. Modernizing Medicine originally acquired gMed in September 2015 to increase its presence within the market and strengthen its product offerings. Since then, the gastroenterology EMR system and the products and services in the entire suite have continued to evolve to support gastroenterologists in their practices, ambulatory surgery centers (ASCs) and hospitals. During ACG, Modernizing Medicine Gastroenterology will showcase one of its latest product enhancements, gGastro® Mobile. Physicians can use the application to log in, view their schedule, search and view a patient, and/or see certain patient details, including demographics and patient summary (medications, allergies, etc.). 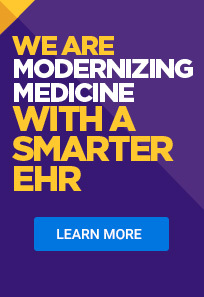 The application works with the gGastro® EHR solution and can be accessed virtually anywhere providers have an internet connection. It will be available for both iOS and Android smartphones. gKiosk™, an iPad application that streamlines patient check-in, checkout and discharge in the office or ambulatory surgery center (ASC). gPortal™, an online patient engagement tool that patients can use in their home, at work or elsewhere. gReminder™, a patient reminder system for patients to confirm appointments. The gGastro Suite also includes gGastro® EHR, gPM™ practice management system, Revenue Cycle Management, gInsights™ analytics platform, gGastro® ERW and more. To see how these solutions can benefit gastroenterology practices, ASCs and hospitals, visit Modernizing Medicine Gastroenterology at booth #500 during ACG from Sunday, October 7 to Tuesday, October 9 at the Pennsylvania Convention Center in Philadelphia, Penn. Modernizing Medicine Gastroenterology, formerly gMed®, a Modernizing Medicine® company, provides the gastroenterology industry with an integrated health IT platform for private practices, ambulatory surgery centers and hospitals. Data-driven products and services include an EHR system, endoscopy report writer, practice management solution, patient engagement portal, value-based care solution, data analytics and revenue cycle management services. For more information, please visit www.modmed.com/gastroenterology. gMed Canada, Inc. is a wholly owned subsidiary of Modernizing Medicine Gastroenterology, Inc. For more information, please visit www.gmed.ca or call 604-260-5504.